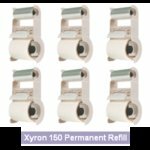 Create your own stickers with the Model 150 "X" Dispenser by Xyron Create-A-Sticker. 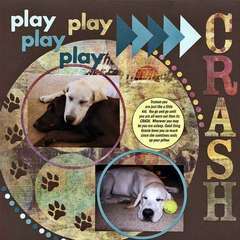 Create permanent or repositionable stickers that are up to 1.5" wide! 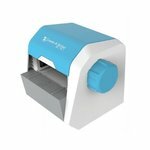 This dispenser is perfect for mini photos, die-cut letters, small embellishments and more. This is an affordable must-have for any scrapper! I originally purchased it to use with smaller letters, embellies, etc. cut from my cricut. After dealing with the nightmare of liquid glue and glue pens getting EVERYWHERE, I decided there had to be a better way - and there was! I absolutely love this little gem of a machine. It's incredibly easy to use and for under $10 you can't beat what it can do. You just drop it in the top and pull it out the other side. I've found that using any of the tools that come with your rub-on packs around the edges takes care of any extra adhesive. Before I purchased this little guy, I thought about getting one of the larger ones, but I figured I'd only be using it when I used my Cricut so I didn't want to spend the extra money. But it turns out that this is the perfect size, anything too big to put in the X is big enough to use with a different adhesive. It turns out I use this for all kinds of things, not just for the Cricut. If you put chipboard letters through, face down, it'll apply adhesive to the top and then you can sprinkle it with glitter, flocking, or whatever you like. You can also do this to get adhesive on both sides by running it through once, peeling off the top, turning it right-side-down, and running it through again. I also run my ribbons through it and, voila, self-adhesive ribbon. It really opens up a lot of creative possibilities. Thanks Xyron, for creating such a great product at an affordable price! I can't imagine scrapbooking without my Xyron 150. I finally started using cut titles last year after purchasing a Quickutz Squeeze tool…the Xyron 150 makes adhering those tiny letters and numbers a breeze…just drop the letters into the chute, pull the adhesive out the other end and voila, a sticker! No more sticky fingers messing with glues and small pieces of paper, no cleanup of glue leaking out from under die cuts. And not only is this good for titles but for any smaller pieces of paper or narrow strips. I did a page recently that used several small journaling blocks/strips along with paper borders…I just used this to make stickers out of all of them and presto, gluing down those pieces was a snap. I love my little X! This is definitely one of my best purchases. When I first started scrapping, I bought a lot of tools that I now think - Why? This one is different. It is great and I use it frequently. The size is perfect for small die cuts. I use my die cut machine to cut out small alpha letters but they are too small to attach with regular adhesive. But, slip them through this easy to use product and voila, they attach easily. The tape adhesive seems to last forever! My only caveat is that you should make sure you rub the plastic top layer several times before you attempt to peel the backing - this helps to ensure you have a good bond between the adhesive and whatever you want to stick. And boy does it stick! Enjoy! This is one of those products that I can't live without. I use it for adhering my letters and small die cuts from my cricut machine. It is very easy to use and the refills are also easy to change. All you have to do to create a sticker, is place your letters or die cuts in the opening, face up, and then pull the tape from the other side. Tear off the tape and then, using a bone folder, popsicle stick, or something hard, rub around your letters firmly. Carefully peel the clear covering off the top of the letters, and then stick your letters to your layout! If you have some extra adhesive around your letters, you can use an adhesive eraser or art gum eraser to remove it. The refills just snap in and out of the X. Very easy! The X will take items up to 1.5 inches. 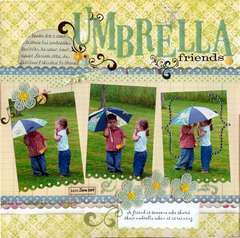 It is perfect for patterned paper, card stock, and very thin chipboard. I use my Create-A-Sticker for things that are difficult to add adhesive to or if I want something to be completely flat. I run tiny cut-outs through it, ribbon, raffia bows, and my special signature logo. Each of my cards has my very own signature logo on the back. I make the logo on my computer, cut it out with my 1" circle punch, then run about 20 at a time through my Create-A-Sticker. After rubbing the back with my EK Success Rub-on Tool to make sure they are all stuck tight, I pull the clear front off and leave them in a small roll in my embellishment box. They are ready whenever I need them. I just pull the logo off and attach it to the back of my card. If there is a little sticky left on the edge, I use my EK Success Adhesive Remover to rub it off. The logo is perfectly flat and will stay that way. This is one of the most frequently used tools in my scrapbooking tote. 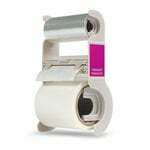 It's inexpensive, light, easy to use, and the roll of adhesive lasts forever. I bought the xyron 510 model because I liked the idea of interchangeable cartridges, but I use this one at least 10 times more frequently. Why pay a lot more money to get adhesive backed cardstock for your diecuts when you can easily just run the diecuts through your xyron after you're done cutting? A couple of tips: use a bone folder or similar object and rub the adhesive film before removing it to make your sticker come off the backing paper easier. Also, if you get some extra adhesive on the page, xyron makes an adhesive eraser - or you can use any gum araser from an art supply store. My Zyron "X" goes with me everywhere. It's lightweight and small enough to take along anytime I'm away from home doing papercrafting. I love to use it for ribbon embellishments because I can simply run it through my X and the adhere it to my project without getting smears of adhesive or having to fuss with putting down dots. I do try to maximize the adhesive roll by doing all the items I know I'll be putting adhesive on all at once so I don't waste the 1" of tab at the beginning of each application and I will also run 2 pieces of ribbon through side by side if they fit to get the most out of the width. This is a fun and easy way to make a sticker out of any small shape and I would think it would make anyone who papercrafts happy to have it by their side! I am new to scrapbooking so when I purchased this product, I didn't even know what I was buying because I was running around the store buying everything in sight! When I finally got around to using this product, I was pleasantly surprised how well it works because I am a big believer in you get what you pay for and this is a relatively inexpensive piece of work. I was thinking it was so simple that it won't work well, but it is a great, simple little products to make stickers 1.5 inches wide. 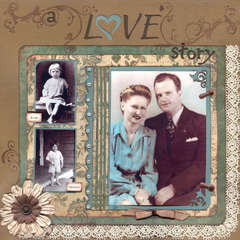 A good tool for the beginner or even advanced scrapbooker. I am not sure about the other sticker makers out there, but I am sticking with this one until I need a wider one. 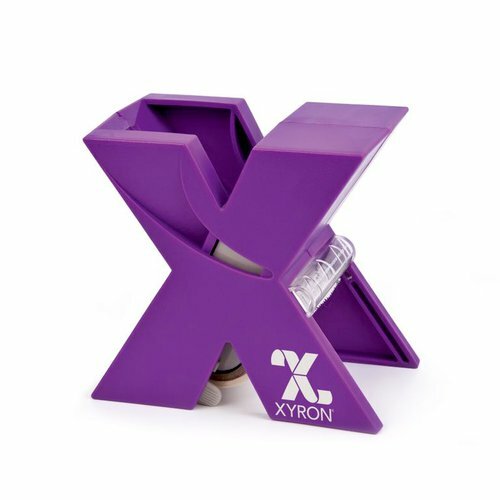 I have a had good success with Xyron products and definitely would try any of their items. I resisted buying a sticker maker for the longest time. Then I got my Cricut die cutting machine. So I went out and bought the Xyron 500, which is great and can make 5" stickers, but I found that I wasn't really cutting large items with my Cricut. So I bought the Xyron 150. Boy what great tool. I can fit all my smaller die cuts in it and I don't waste alot of the adhesive. I cut a lot of letters for my titles and this X is great, even for the dots of an I! Its very easy to use and you don't have to plug it in. The only problem I've encountered is the excess adhesive that can be on the newly made stickers, but its not bad and the alternative of not using the X is a horror I don't want to contemplate! I have been scrapping for 5 years and just got the little X. I have the xyron 500 (which is also great), but I don't know how I lived w/o this one for so long! 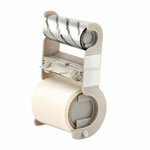 It works great for those little hard to adhere die cuts or letters, and it also works great for ribbon. Even though I have a larger one, I love this for when I only have a few things to put through so I don't waste the adhesive. Definitely get a glue eraser though, as you will sometimes get extra adhesive around the edges of what you put through. Even with having to use the glue eraser, it is still faster and more convenient than dealing with trying to put adhesive on such a small thing. Highly recommend! Does it come with an initial package of adhesive? If so, how much (length)? By: User (08-Jul-14) Helpful Question? Yes | No Thank you! Report Inappropriate This question has been reported. Thank you! Yes it does, but on length (how much) I donot remember. By: hkstareyes (12-Jul-14) Helpful Answer? Yes | No Thank you! Report Inappropriate This Answer has been reported. Thank you! 20ft By: mythicalgriffons (13-Jan-17) Helpful Answer? Yes | No Thank you! Report Inappropriate This Answer has been reported. Thank you! Is the adhesive included permanent or repositionable? By: AmberG22 (20-Nov-15) Helpful Question? Yes | No Thank you! Report Inappropriate This question has been reported. Thank you! This item includes permanent adhesive. By: Amber Boren (20-Nov-15) Helpful Answer? Yes | No Thank you! Report Inappropriate This Answer has been reported. Thank you!